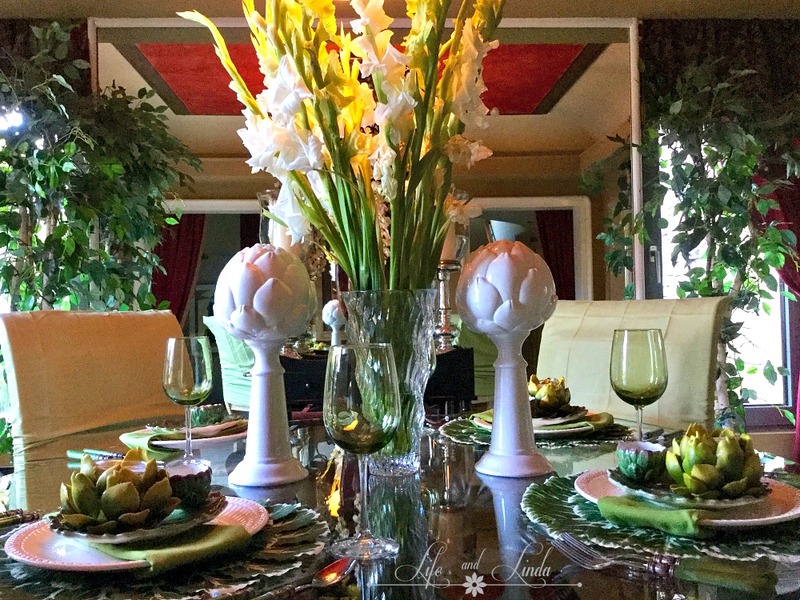 Lovely gladiolas fill the crystal vase to add some ambiance and height to the table. Green flatware from Horchow complete the green theme with the dollar store green goblets. I am using the cabbage leaves placemat, because they seem to go perfectly with the green and white theme. 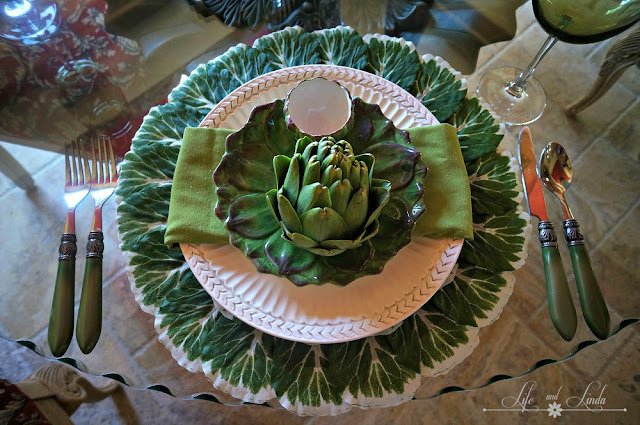 I bought the cute special artichokes plates years ago at Sur La Table. 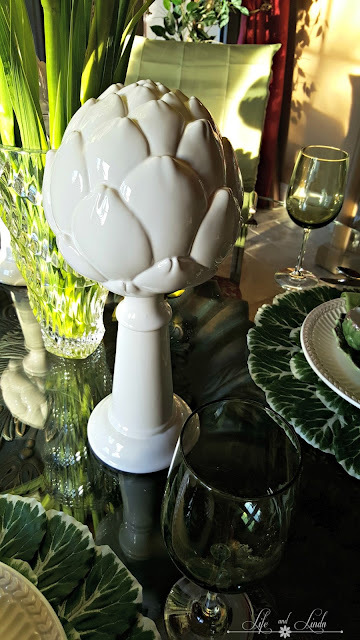 Perfect for artichoke with their little cup for sauce. I found these beautiful white artichokes at Ross, while shopping with my Mom. My husband loves artichokes. He is the one who cooks them and makes his secret sauce. They are a good source of vitamins. The chart below shows perfectly the nutrients. 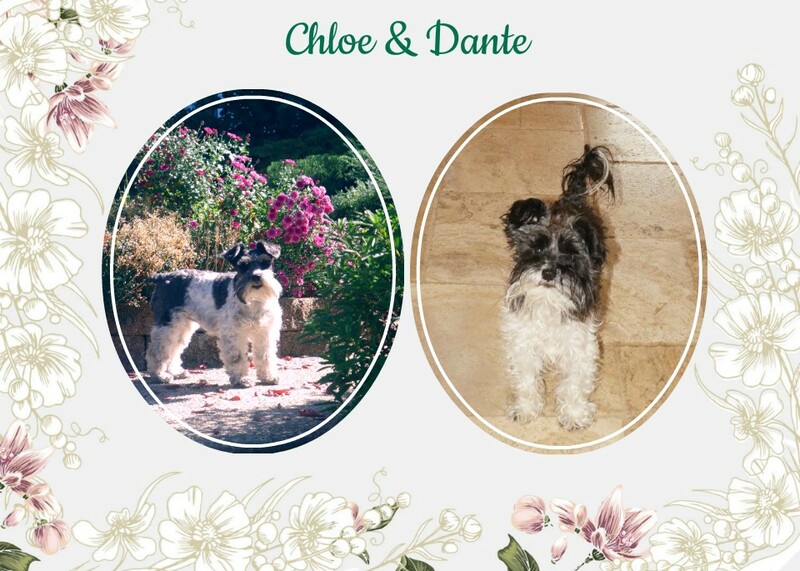 When left in the garden, they will bloom into beautiful purple flowers. I hope you have a great weekend. It's pool time, so I am down by the pool relaxing. Pretty table Linda. Love the artichoke theme. Those new plates from Sur La Table are great. I love that store. The gladiolus are beautiful and added more elegance in the crystal vase. Enjoy your pool time!! Thank you Liz. 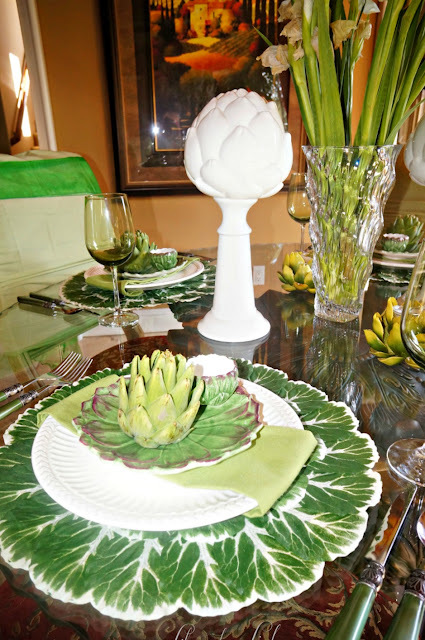 Yes, those artichoke plates are perfect for artichokes. Enjoy your weekend. Every single photo is a feast for the eyes. I immensely enjoyed the fabulous presentation. Thank you Joseph....I love setting a pretty table....happy weekend. 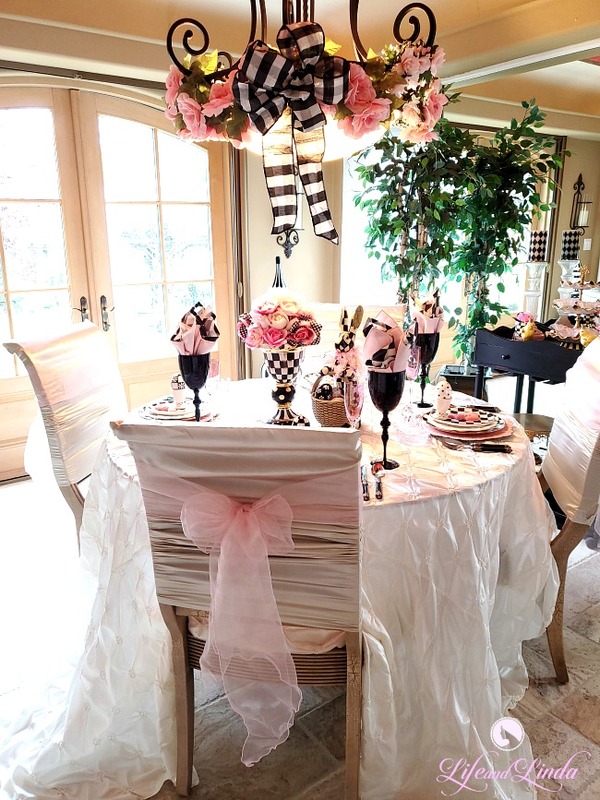 What a pretty tablescape, Linda! 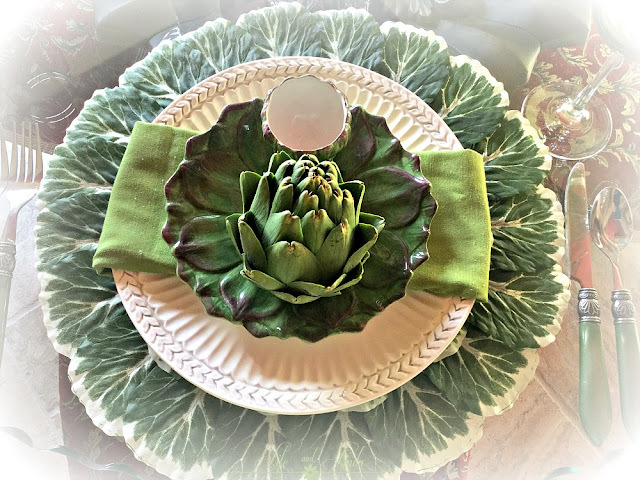 The placemats are perfect and I remember those artichoke plates from Sur La Table. I'll bet you get great artichokes out in CA! I just dip mine in melted butter, but I'll bet your hubby's secret sauce is wonderful! Mayonnaise, lemon juice, Tabasco, garlic powder, salt and pepper. Don't tell anyone, it's a secret. Thanks Kitty, artichokes are good with butter as well as the sauce. 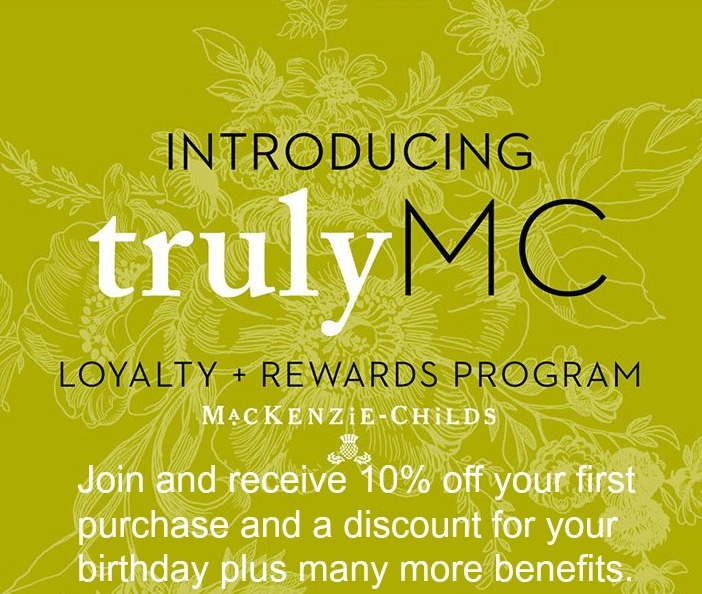 Love that store! Hope your weekend is fabulous! 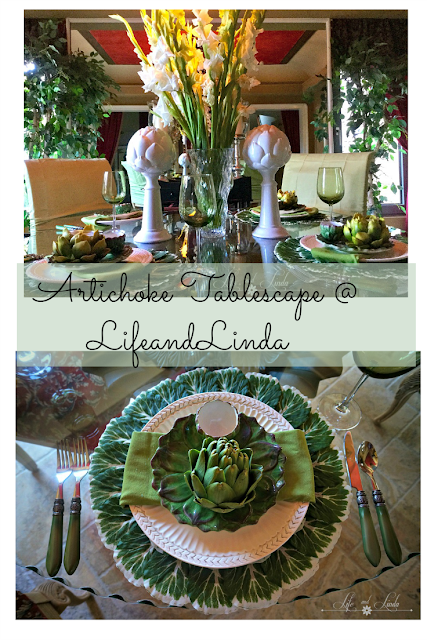 Hi Linda, what a beautiful table setting with an artichoke theme. I love your pretty white set from Ross. I miss the Ross we had close by. It closed and was replaced with Bed Bath and Beyond. Just not the same!! Your cabbage plates are beautiful too and I love the little side bowl. The secret sauce sounds so good. Thank you Celestina Marie. So sorry your Ross store closed. They have some great bargains. I hope you get to enjoy your pool as well. I know the weather has been crazy this year. Have a fantastic weekend. Fabulous. We are an artichoke lovin family. 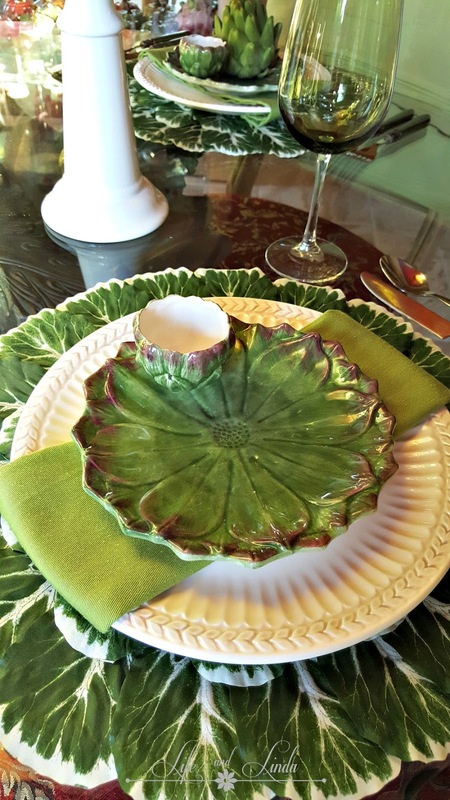 I found my artichoke plates at Goodwill. Your pool time sound lovely and relaxing. Thank you Ellen. I would love to see your artichoke plates. 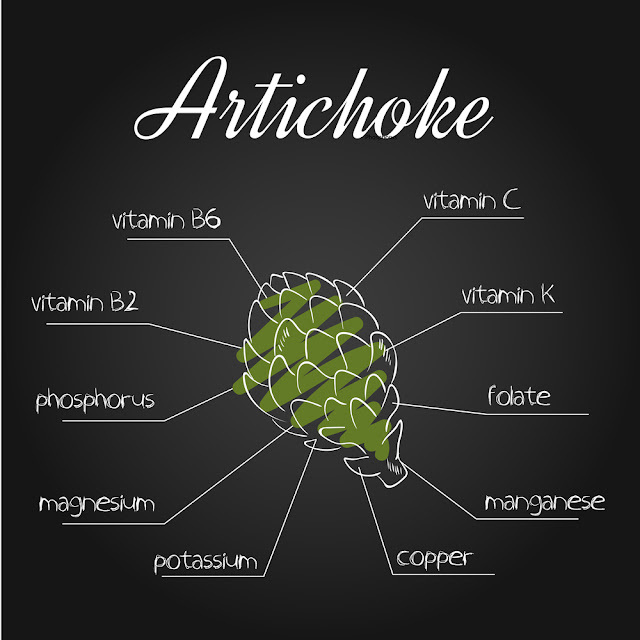 Some people do not like artichokes or don't know how to eat them. Enjoy your lovely pool time, I know how relaxing that can be. 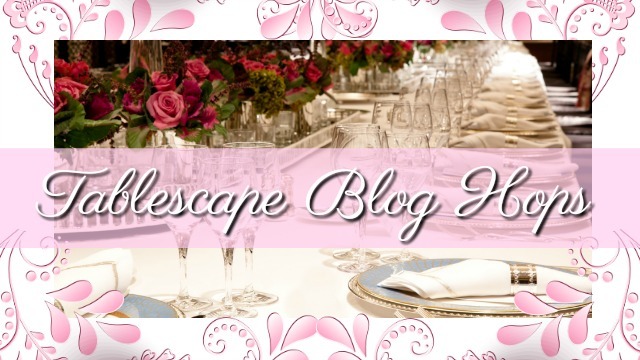 I am always inspired by your table settings Linda, and this may be on of my favorites:) Although I think I may think that every time! I am fond of the artichokes. 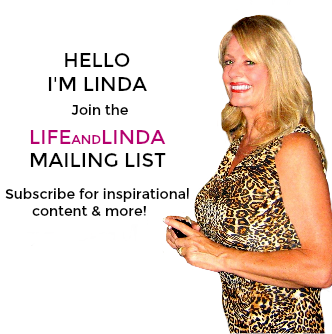 Have a lovely Saturday and I did get my email taken care of. Thank you again my dear California Friend. Pretty table. 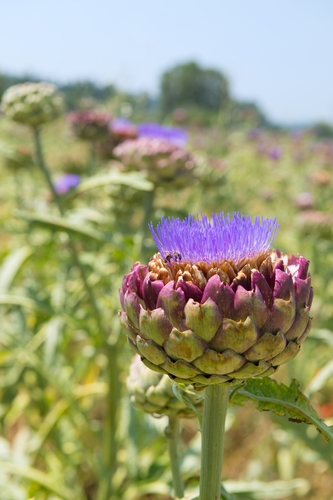 We love artichokes here. I've never seen one bloom. Do you grow your own? Thank you Sarah. There are beautiful when you leave them in the garden. We have planted our own as well. Happy Sunday. What a pretty table Linda! I love artichokes and didn't realize what a pretty bloom they have. Happy Sunday. Lovely and creative as usual! Glads are My Rare One's favourite flowers. I always try to buy her a couple of big bunches when they're in season. A single stalk looks gorgeous all by itself in a Japanese ikebana dish as well. 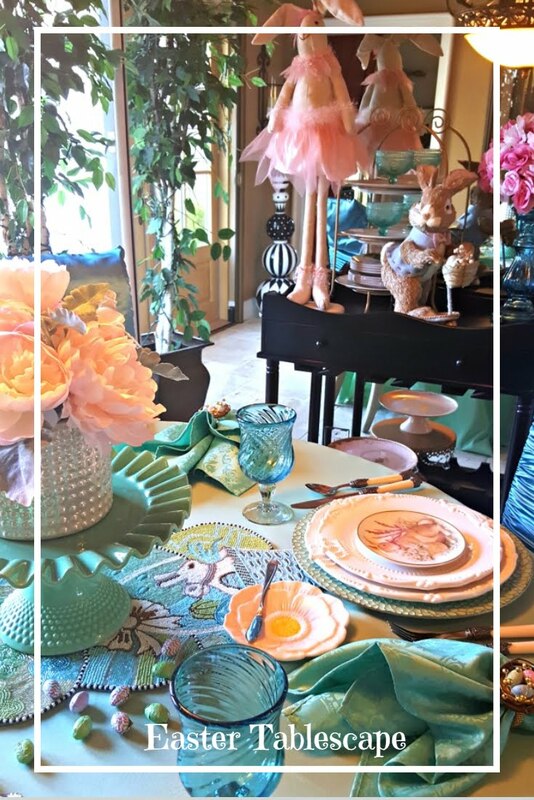 The most scrumptious colors are in your tablesetting! 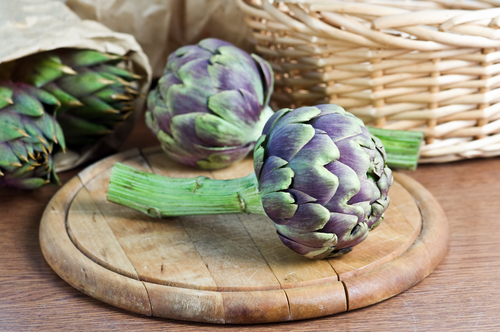 I'm ashamed to admit that I've never eaten fresh artichoke. But I would if someone cooked them for me! I love your table, Linda. Fun and absolutely perfect for the season. I love artichokes too so I best stop by so that Paul can cook me up a big bowl full! Such a beautiful table, Linda, and very unique. 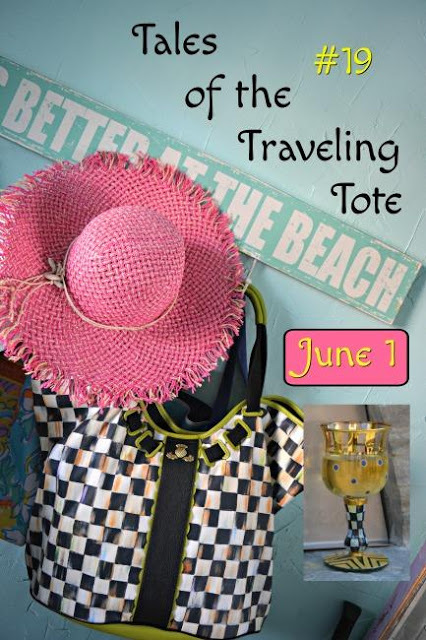 Love all the artichoke accessories - so fun! Pretty! Green and white is a favorite color combo of mine, too. It’s so fresh, and with these hot dog days of summer we need all the crisp, lively looks we can get to cool us off! I had no clue what an artichoke looks like out in the field. I learn something new all the tine in Blig Land! Enjoy your relaxation time down by the pool 🏊🏼‍♀️!! !